Well, I am a stay at home mum of two lovely girls aged 6 and 3 ½ and a lovely husband of course, currently based in my husbands home town of Auckland. I grew up in the Rangatikei in a place called Hunterville on a hill country sheep and cattle farm. I couldn’t have asked for a better way to grow up. When I left school I trained as a chef and followed this path up until I had my 1st child. I have always enjoyed crafts. 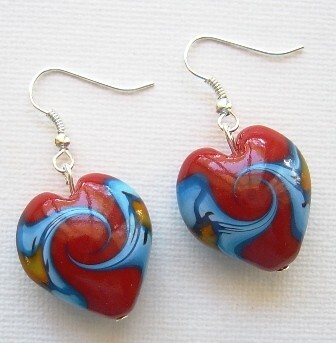 I have done photography, painting, cross stitch, (thanks mum) and now my passion is polymer clay. I have been making beads for the last 2-3 years so I am relatively new to it and have a great deal yet to learn and explore. Polymer clay is great stuff. I am thankful for online stores and facebook (which is how I found you guys too) which has helped me get noticed, but still have a bit to learn in that department like blogging. Well right now when it comes to polymer clay I have been trying anything and everything as far as techniques go. There is just so much you can do with it, I can never be short of things to create. Not a great deal to be honest, a lamp, fantasy book and a trinket box that has mushrooms on it :) Sometimes I have a recent drawing from one of my girls or a toy of the day. Well I just love fantasy books, something my mum introduced me to. There is nothing better than winding down to something that is make believe, to take your mind off everyday life and to dream. My creative role model would have to be my mum she is a well known New Zealand potter and great all round artist. I can thank her for introducing me to the world of arts and crafts including polymer clay. She was studying ideas for her work and purchased a book on polymer clay which is how I started. Definitely all things food. I love to cook, from family meals to homemade bread to preserving and even recently cheese. To be honest I can’t answer that question. I have little time to do my work as it is because I run the household let alone know what wonderful workshops there could be. But if it could be anything a polymer clay workshop of course and most definitely a “how to be a domestic goddess” course! 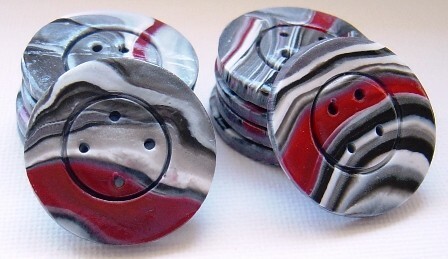 I have found I tend to create some very funky beads from scrap clay. 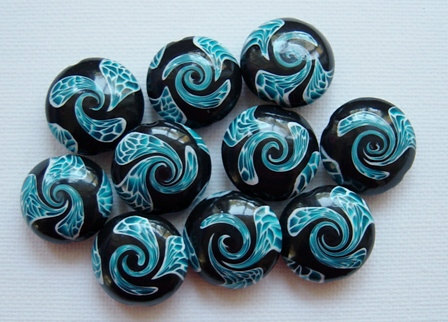 So if something goes wrong it does not follow to my plan I turn the clay into fun swirl beads, people love them. I have a small writing desk that use to be my mums that I use. Not nearly big enough really but it is my little corner. Not really at the moment. Just to be happy with my family, learn more about my craft and excel at it.